The name Rolex carries instant recognition – one of a reputable company creating exclusive timepieces. There are many reasons why Rolex watches are so famous and the company behind them has worked arduously to strengthen and maintain its reputation. A Rolex on your wrist is a solid indicator of status and luxury. It shows the world that not only do you have exquisite taste, but also the financial means to choose the best timepiece. The Reputation Institute publishes an annual study, rating companies for overall reputation, according to consumer opinion. The study utilizes consumer survey data from worldwide consumer markets. The Reputation Institute uses over 55,000 interviews to gather information for the study. 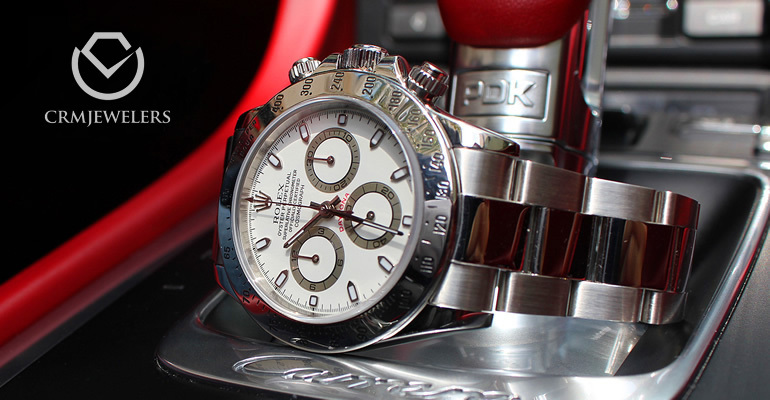 The 2014 study placed Rolex tied at number two with BMW out of 100 companies rated. The two companies tied at number one were Walt Disney and Google. The remaining companies making up the top 10 included Sony, Canon, Apple, Daimler, LEGO, Samsung and Microsoft. The traits that set these companies apart from the rest include exceptional consumer trust and consistent delivery of relevant stories that spark consumer interest – traits that Rolex has convincingly mastered. Consumers seem to revere Rolex and its impressive history. The Rolex story from its inception has consistently modeled unwavering excellence and attention to precise detail. Founder Hans Wilsdorf began Rolex in 1905 with a dream of creating a rarity in the market at the time: a wristwatch. Timepieces during his days were notoriously imprecise and unreliable, but Wilsdorf had a vision to change all this. Even from the beginning, the selection of the name “Rolex” was a deliberate choice, chosen because of its simplicity, how it sounded in different languages, and how gracefully it would appear on the watch dials. One of the first Rolex challenges involved perfecting the chronometric precision movements of the the company’s watches. The Official Watch Rating Centre, located in Bienne, awarded Rolex the first Swiss Certificate of Chronometric Precision in 1910. Rolex continued its quest for excellence and earned the class “A” precision certificate in 1914, awarded by Kew Observatory of Great Britain. Receiving this award was a turning point for Rolex, which thereafter became renowned for its precision watch movements. The Rolex organization has never used their past successes to sit on its laurels. Instead, the company has always been reaching for greater excellence since the very beginning. In 1926, Rolex designed the first watch that was both waterproof and dust-proof, with a hermetically sealed case. Rolex also celebrated the invention of the first self-winding wrist chronometer in 1945. By the 1950s, Rolex turned its innovative attention to creating watches that would withstand deep-sea diving, mountain climbing, aviation and scientific exploration. Rolex has succeeded in creating a name that is synonymous with status and success. When someone wants to reward himself or herself or mark a personal achievement, the purchase of a Rolex has become a natural choice. In fact, buying a Rolex as a form of personal indulgence is not only an accepted norm, but is also applauded by consumers. This suggests a highly emotional connection between Rolex and their buyers. The unwavering brand value of Rolex is an integral reason for this high level of consumer loyalty. Purchasing a Rolex watch carries long-term benefits for the owner. Although the timepiece initially falls in value if purchased at retail, it steadily regains its value over time – eventually surpassing its initial price (read “Is Investing in Rolex Watches Better than Stocks,” for a real life example). A Rolex watch can become a solid investment for the person who purchases it with the intention of owning it for the long run. Rolex watches are also plentiful on the resale market. Pre-owned Rolex watches actually surpass the new Rolex market due to the tendency vintage Rolexes have of appreciating in value. A Rolex watch that has been well-maintained can have an extensive life, often changing hands several times in its lifetime. The Rolex company has succeeded in maintaining its image of greatness throughout 100+ years of service. Even though the world has changed drastically throughout this time, the Rolex company has successfully overcome strong competition, a changing marketplace and innovations in technology. Some technology buffs even contend that the wristwatch is a dying dinosaur. Nevertheless, Rolex has succeeded in keeping the demand for their timepieces strong and their designs classic. Rolex watches haven’t changed drastically over the years, and even vintage Rolexes still carry a hefty price tag in the consumer market. Although Rolex may not pull in the high visibility of other luxury companies, its quiet presence keeps it steadily on the minds and on the wrists of discerning consumers. Rolex also prioritizes international advertising to maintain its credibility and public appearance. With solid consumer confidence and devotion standing behind Rolex, it’s likely that this company will continue to withstand the test of time. Visit our Rolex section to see our different models from the brand.